Background: In patients with acute myocardial infarction or unstable angina undergoing coronary angioplasty, abciximab reduces major adverse cardiac events (MACE). Most clinical trials have studied mainly intravenous administration. Intracoronary (IC) bolus application of abciximab causes very high local drug concentrations and may be more effective in reducing acute and sub-acute stent thrombosis (ST). We studied whether IC bolus administration of abciximab is associated with a reduced ST and target vessels revascularization (TVR); therefore, less MACE rate compared with the standard intravenous IV bolus and infusion application. Materials and Methods: This was a single-center observational study conducted between June 2007 and 2009. We studied a total of 447 patients admitted with either acute coronary intervention (PCI) and stenting. Patients with bleeding disorder, recent major surgery and high blood pressure were excluded. Patients were divided into two groups: Group I (n = 199) patient received IC bolus of abciximab (reopro) 0.25 μg/kg during the PCI in cath lab. Group II (n = 248) received the standard dose of reopro-a bolus intravenous 0.25 μg/kg and maintenance dose of 0.125 μg/kg over 12 h.
Results: There were no differences between the groups with regard to diabetes mellitus, group I (56%) vs. group II (58%), P = 0.613; ACS, group I (38%) vs. group II (44%), P = 0.175; Dietthylstilbestrol Drug eluted stent (DES) in group I (66.5%) vs. (57.6%) group II, P = 0.056; Bare Metal Stent (BMS) in group I (33%) vs. (40.7%) group II, P=0.093; target vessel revascularization (TRV) was seen in 9 patients (4%) in group I vs. 16 patients (6%) in group II. ST elevation was seen in 4 patients (2%) in group I vs. 7 patients (2.8%) in group II, all presented with STEMI. Conclusion: In this study, there was a trend toward less ST and TVR in patients who received IC reopro vs. intravenous route both in ACS and stable CAD. The percentage of DM was high in both groups (56%), especially in Saudi patients. 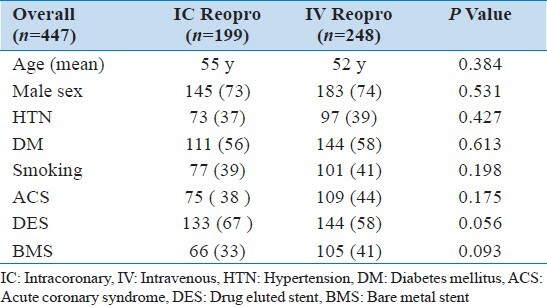 In-stent restenosis (ISR) was less in group I than in group II, this was mainly associated with BMS usage. The percentage of BMS was more than 30% in both groups, either due to STEMI cases or large vessel size. Randomized controlled trials are warranted to further assess IC application of abciximab in reducing ST. This was a single-center observational study conducted between June 2007 and 2009. We studied a total of 447 patients admitted with either acute coronary syndrome (ACS) or stable coronary artery disease (CAD) undergoing PCI and stenting patients were divided into two groups. Group I (n0 = 199) patients received IC bolus of abciximab (reopro) 0.25 μg/kg during the PCI in Catheterization Laboratory. Group II (n = 248) received the standard dose of reopro, an intravenous bolus 0.25 μg/kg and maintenance dose of 0.125 μg/kg over over 12 h. Exclusion were prior fibrinolysis. Patients with bleeding disorders, recent major surgery and high blood pressure were excluded, known allergy to heparin, aspirin, or abciximab; active severe bleeding; pregnancy; history of major surgery <4 weeks; and cardiogenic shock with mechanical ventilation. As per protocol, the abciximab bolus administration was during PCI, after crossing the lesions either in stable CAD with PCI guide wire or after thrombus penetration in ACS patients to achieve very high local concentration. As per protocol, the abciximab bolus administration was during PCI. In the IC group I, in ACS (STEMI) patients, bolus administration was recommended after infarct-related artery recanalization by the PCI wire before balloon dilatation to allow high abciximab concentration in the target region. The bolus was administered directly through the guiding catheter. Filtering was performed before the abciximab solution was pulled into the syringe. 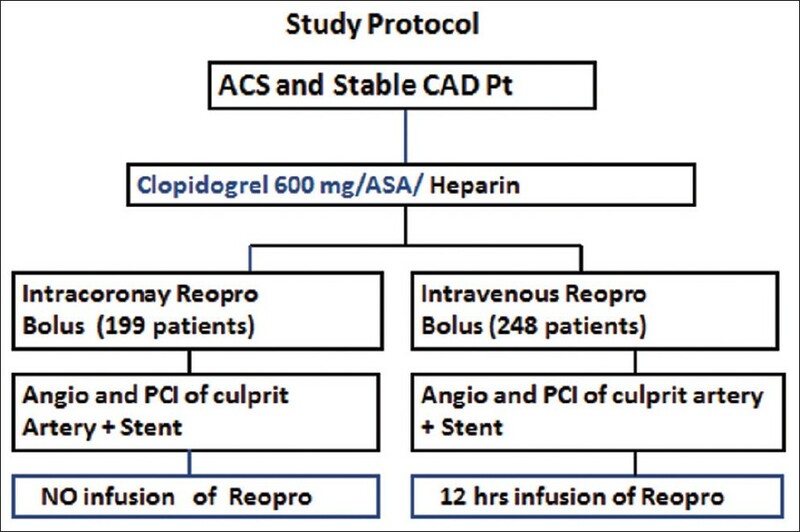 Group I ( n = 199) patients received IC bolus of abciximab (reopro) 0.25 μg/kg during the PCI in Catheterization Laboratory, group II ( n = 248) received the standard dose of reopro, a bolus intravenous 0.25 μg/kg, and maintenance dose of 0.125 μg/kg over 12 h. All patients received 500 mg aspirin and heparin (60 U/kg body weight) intravenously before PCI. Stenting of the culprit lesion was recommended unless the vessel had a diameter <2.0 mm. Clopidogrel (600 mg, orally during PCI, if not administered before, followed by 75 mg/day for at least 12 months) was mandatory. Group II ( n = 248) received the standard dose of reopro, a bolus intravenous 0.25 μg/kg and maintenance dose of 0.125 μg/kg over 12 h [Figure 1]. Coronary angiography of the target lesion was performed before and after PCI with the same projections. Angiographic projections used were those that allowed optimal evaluation of the lesion. Angiographic analysis included initial and final lesion assessment including thrombus formation and in-stent restenosis (ISR). Visual assessments were performed off-line by two blinded interventional cardiologists. At the 30-day follow-up, there were two cardiac deaths (1.0%) in the IC (group I) and three deaths (1.1%) in the intravenous abciximab (group II). Differences between group means were assessed with the two-tailed, Student's t-test. Chi-square analysis or Fisher's exact test were used to evaluate differences between proportions. Statistical significance was defined by a P value of less than 0.05. Patient's demographic are presented in [Table 1]. The mean age in group I and in group II were 55 and 52 years, respectively, and the majority of study patients were men (73%). Diabetes mellitus (DM) was the most prevalent risk factor for CAD in our study population. There were no significant differences between the groups with regards to DM, group I (56%) vs. group II (58%), P = 0.613. Hypertension was the second most prevalent risk factor. The incidence of ACS in group I was 38% and that in group II was 44% ( P = 0.175). The usage of diethylstilbestrol drug eluted stent (DES) in group I was 66.5% vs. 57.6% in group II ( P = 0.056). BMS in group I was 33% vs. 40.7% in group II ( P = 0.093). 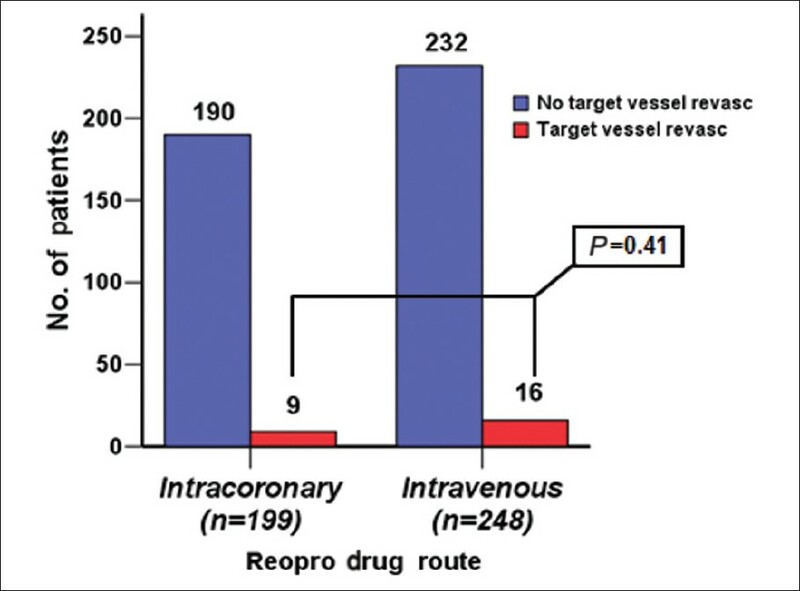 Target vessels revascularization (TVR) was seen in 9 patients (4%) in group I vs. 16 patients (6%) in group II ( P = 0.41) [Figure 2]. ST was seen in 4 patients (2%) in group I vs. 7 patients (2.8%) in group II ( P = 0.76) [Figure 3]; all ST patients presented with STEMI. ISR was seen in 5 patients (2%) in group I vs. 16 patients (7%) in group II ( P = 0.07) [Figure 4]. 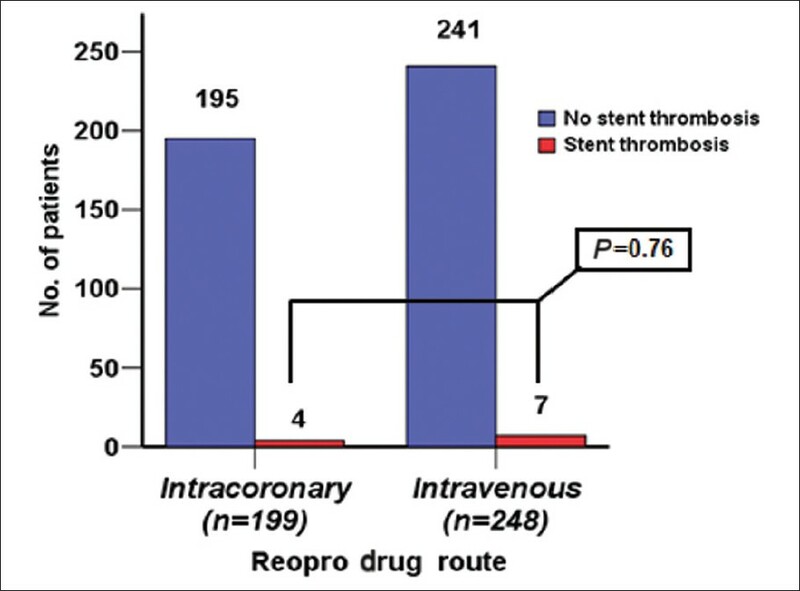 The sub-analysis of ISR according to the type of stent, clearly showed more ISR in BMS with 2 patients (3%) in group I vs. 11 patients (11%) in group II ( P = 0.14) [Figure 5]. Angiographic confirmation of a thrombus that originates in the stent or in the segment 5 mm proximal or distal to the stent, with or without vessel occlusion, which is associated with acute onset of ischemic symptoms at rest or electrocardiography (ECG) signs of acute ischemia or typical rise and fall in cardiac biomarkers within 48 h of angiography or pathologic confirmation of ST determined from tissue obtained following thrombectomy. The first finding was TVR. In this particular study, no significant difference in both study groups were seen. Nine patients out of 199 in group I had TRV vs. 16 patients out of 248 in group II ( P = 0.41). 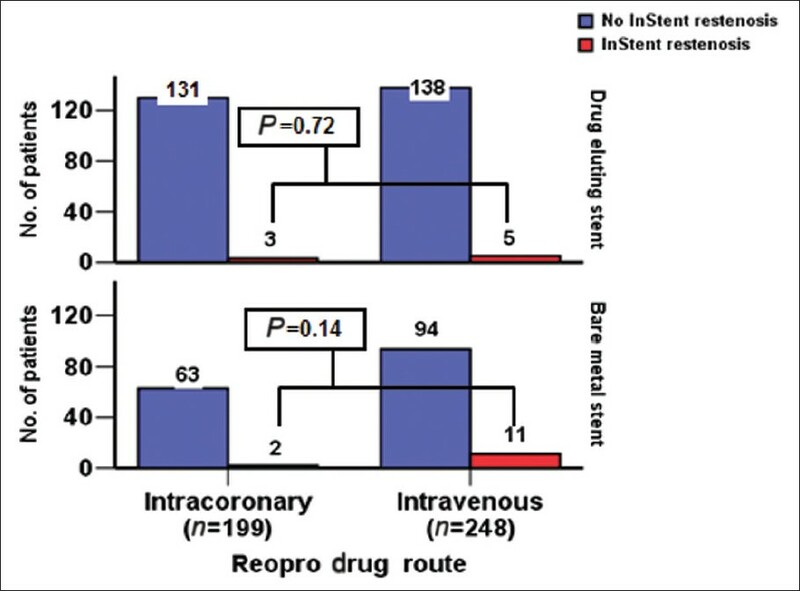 The fourth finding was when we compared bare metal stent (BMS) with DES, there was more ISR in patients who received BMS 11 in 105 in group II vs. 2 in 65 in DES (P = 0.14). This difference was not significant in DES patients, and this is related to the benefit of DES in preventing intimal proliferation and ISR, as published in previous studies. In this study, there was a trend toward less ST and TVR in patients who received IC reopro vs. intravenous route both in ACS and stable CAD. The percentage of DM was high in both groups as reported before in Saudi patients. ISR was less in group I than in group II and this was mainly related to the use of BMS. BMS was >30% in both groups and this was either due to STEMI cases or large vessel size. a randomize trial is warranted to further assess IC application of abciximab in reducing ST. This study was a single-center study. The patient number is medium size on comparing both groups. Abciximab bolus was given in both the groups but there was no infusion dose given in group I (IC). We would like to acknowledge the support of the Emergency Department and Catheterization Laboratory of KACC for helping us in recruiting those patients who fit the criteria of the study. 1. Antman EM, Anbe DT, Armstrong PW, Bates ER, Green LA, Hand M, et al. ACC/AHA guidelines for the management of patients with ST-elevation myocardial infarction: Executive summary. Circulation 2004;110:588-636. 2. De Luca G, Suryapranata H, Stone GW, Antoniucci D, Tcheng JE, Neumann FJ, et al. Abciximab as adjunctive therapy to reperfusion in acute ST-segment elevation myocardial infarction: A meta-analysis of randomized trials. JAMA 2005;293:1759-65. 3. Hamm CW, Heeschen C, Goldmann B, Vahanian A, Adgey J, Miguel CM, et al. Benefit of abciximab in patients with refractory unstable angina in relation to serum troponin T levels. c7E3 Fab Antiplatelet Therapy in Unstable Refractory Angina (CAPTURE) Study Investigators. N Engl J Med 1999;340:1623-9. 4. Barsness GW, Buller C, Ohman EM, Schechter E, Pucillo A, Taylor MA, et al. Reduced thrombus burden with abciximab delivered locally before percutaneous intervention in saphenous vein grafts. Am Heart J 2000;139:824-9. 5. Thuraisingham S, Tan KH. Dissolution of thrombus formed during direct coronary angioplasty with a single 10 mg intracoronary bolus dose of abciximab. Int J Clin Pract 1999;53:604-7. 6. Bellandi F, Maioli M, Gallopin M, Toso A, Dabizzi RP. Increase of myocardial salvage and left ventricular function recovery with intracoronary abciximab downstream of the coronary occlusion in patients with acute myocardial infarction treated with primary coronary intervention. Catheter Cardiovasc Interv 2004;62:186-92. 7. Galache Osuna JG, Sánchez-Rubio J, Calvo I, Diarte JA, Lukic A, Placer LJ. Does intracoronary abciximab improve the outcome of percutaneous coronary interventions? A randomized controlled trial. Rev Esp Cardiol 2006;59:567-74. 8. Thiele H, Schindler K, Friedenberger J, Eitel I, Fürnau G, Grebe E, et al. Intracoronary compared with intravenous bolus abciximab application in patients with ST-elevation myocardial infarction undergoing primary percutaneous coronary intervention: The randomized Leipzig immediate percutaneous coronary intervention abciximab IV versus IC in ST-elevation myocardial infarction trial. Circulation 2008;118:49-57. 9. Cannon CP, Battler A, Brindis RG, Cox JL, Ellis SG, Every NR, et al. American College of Cardiology key data elements and definitions for measuring the clinical management and outcomes of patients with acute coronary syndromes. A report of the American college of cardiology task force on clinical data standards (Acute Coronary Syndromes Writing Committee). J Am Coll Cardiol 2001;38:2114-30. 10. Mascelli MA, Lance ET, Damaraju L, Wagner CL, Weisman HF, Jordan RE. Pharmacodynamic profile of short-term abciximab treatment demonstrates prolonged platelet inhibition with gradual recovery from GPIIb/IIIa receptor blockade. Circulation 1998;97:1680-8. 11. Neumann FJ, Blasini R, Schmitt C, Alt E, Dirschinger J, Gawaz M, et al. Effect of glycoprotein IIb/IIIa receptor blockade on recovery of coronary flow and left ventricular function after the placement of coronary-artery stents in acute myocardial infarction. Circulation 1998;98:2695-701. 12. Romagnoli E, Burzotta F, Trani C, Biondi-Zoccai GG, Giannico F, Crea F. Rationale for intracoronary administration of abciximab. J Thromb Thrombolysis 2007;23:57-63. 13. Marciniak SJ, Mascelli MA, Furman MI, Michelson AD, Jakubowski A, Jordan RE, et al. An additional mechanism of action of abciximab: Dispersal of newly formed platelet aggregates. Thromb Haemost 2002;87:1020-5. 14. AlHabib KF, Hersi A, AlFaleh H, Kurdi M, Arafah M, Youssef M, et al. The Saudi project for assessment of coronary events (SPACE) registry: Design and results of a phase I pilot study. Can J Cardiol 2009;25:255-8. 15. Migliorini A, Valenti R, Moschi G, Parodi G, Cerisano G, Buonamici P, et al. Predictor of stent thrombosis in patients treated with turbostratic carbon-coated stent implantation for acute myocardial infarction. J Interv Cardiol 2010;23:554-9. 16. 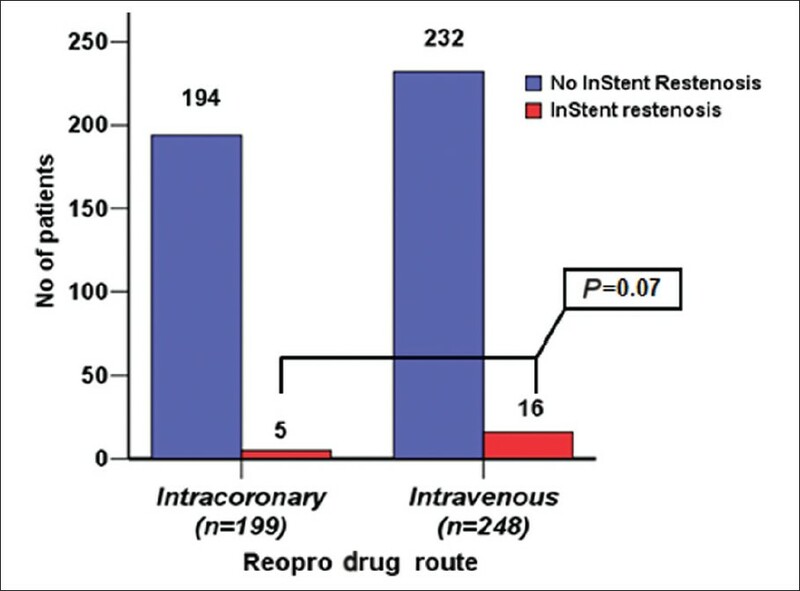 Acute platelet inhibition with abciximab does not reduce in-stent restenosis (ERASER study). The ERASER Investigators. Circulation 1999;100:799-806. 17. Dangas G, Aymong ED, Mehran R, Tcheng JE, Grines CL, Cox DA, et al. Predictors of and outcomes of early thrombosis following balloon angioplasty versus primary stenting in acute myocardial infarction and usefulness of abciximab (the CADILLAC trial). Am J Cardiol 2004;94:983-8. 18. van den Brand M, Laarman GJ, Steg PG, De Scheerder I, Heyndrickx G, Beatt K, et al. Assessment of coronary angiograms prior to and after treatment with abciximab, and the outcome of angioplasty in refractory unstable angina patients. Angiographic results from the CAPTURE trial. Eur Heart J 1999;20:1572-8. 19. Ndrepepa G, Kastrati A, Mehilli J, Neumann FJ, Ten Berg J, Bruskina O, et al. One-year clinical outcomes with abciximab vs. placebo in patients with non-ST-segment elevation acute coronary syndromes undergoing percutaneous coronary intervention after pre-treatment with clopidogrel: Results of the ISAR-REACT 2 randomized trial. Eur Heart J 2008;29:455-61. 20. Godicke J, Flather M, Noc M, Gyongyosi M, Arntz HR, Grip L, et al. Early versus periprocedural administration of abciximab for primary angioplasty: A pooled analysis of 6 studies. Am Heart J 2005;150:1015. 21. Maioli M, Bellandi F, Leoncini M, Toso A, Dabizzi RP. Randomized early versus late abciximab in acute myocardial infarction treated with primary coronary intervention (RELAx-AMI Trial). J Am Coll Cardiol 2007;49:1517-24. 22. Ellis SG, Tendera M, de Belder MA, van Boven AJ, Widimsky P, Janssens L, et al. Facilitated PCI in patients with ST-elevation myocardial infarction. N Engl J Med 2008;358:2205-17.